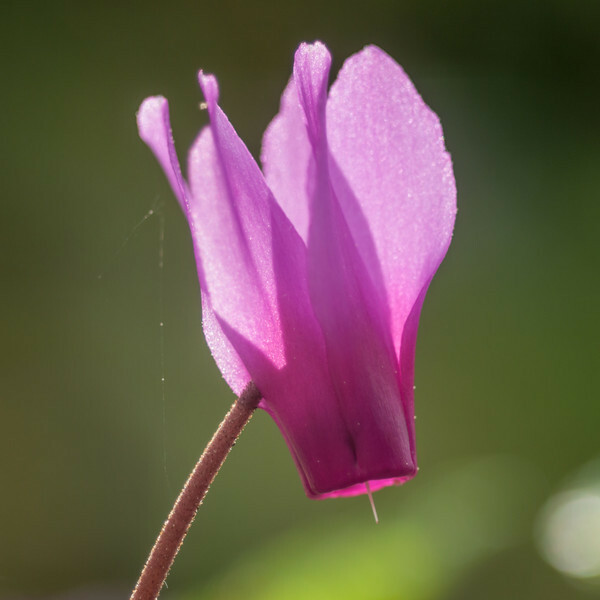 Today I am "teaching" about a group of plants that I have photographed in Corsica (like the Corsican crocus), but that also occurs elsewhere in Europe and around the Mediterranean Sea: the genus Cyclamen. Even if you are not living in the native distribution area of the cyclamen, which is the case for the majority of the readers of this text, these plants may seem familiar. Cyclamen are popular house and garden plants and many varieties and hybrids have been bred. The popularity among gardeners and collectors is even the reason why cyclamen have become rare in some regions. The typical shape of a Cyclamen flower; in this case of Cyclamen repandum. Depending on the species, the color of the flower ranges from almost purple to even white and the shape of the petals and the "nose" may differ as well. 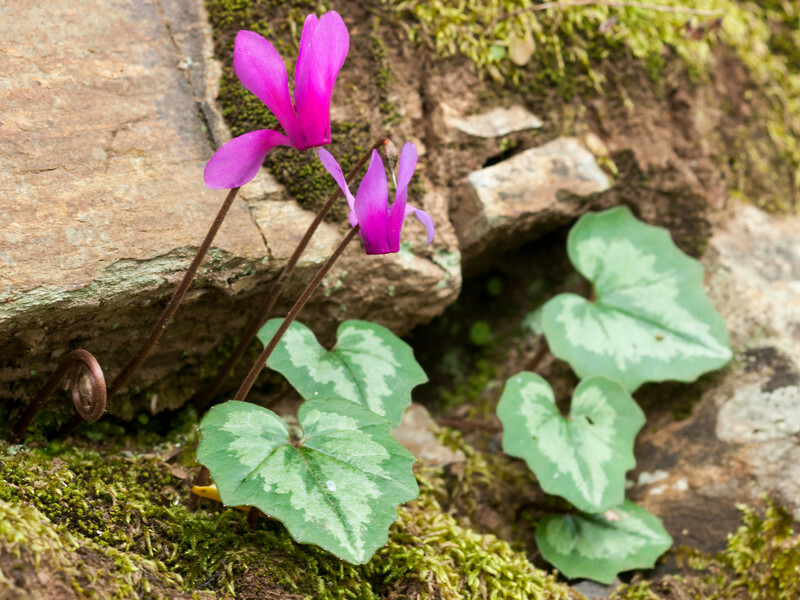 If you travel and hike in Corsica in springtime, it is hard not to see the beautiful pink flowers of Cyclamen repandum, the species occurring in southern Europe. This plant thrives particularly well in forests and on rocky ground, just as seen in the photograph above. It is not only the bright pink corolla that attracts the eye, also the large, heart-shaped and bicolored leaves are quite distinctive. A particular feature of cyclamen species is the curling of the flower stem after fertilization and wilting of the flower, which produces cute little spirals (on the far left in the first photograph). In central Europe, where I live, Cyclamen purpurascens is native, but it seems less common than its southern relative. To the botanist, the flowers and leaves are clearly different from those of Cyclamen repandum, but to the "normal" passer-by the differences are subtle and maybe not as noteworthy. 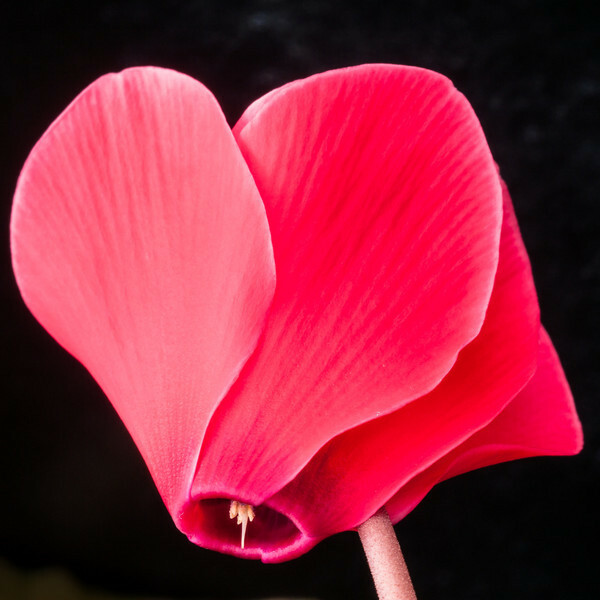 A red flower of a florist cyclamen species. Different flower and leaf colors were bred from the species Cyclamen persicum. Cyclamen are appreciated for their brightly colored and distinctly shaped flowers and many species are commercially available and grown indoors and outdoors. Based on the species Cyclamen persicum a bewildering array of flower and leaf colors and shapes have been bred and are available from florists (just have a look at a Google search result). 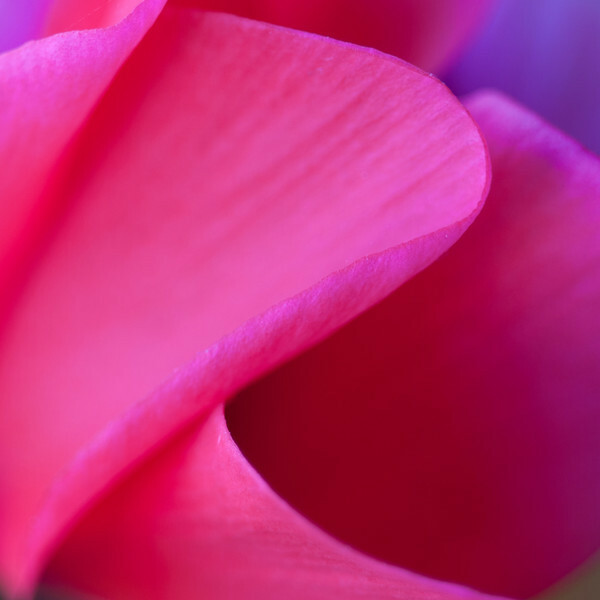 A composition in red showing a detail of a Cyclamen flower.